Things to see and do in Darwin. Graeme and I recently travelled to Darwin for a few days. 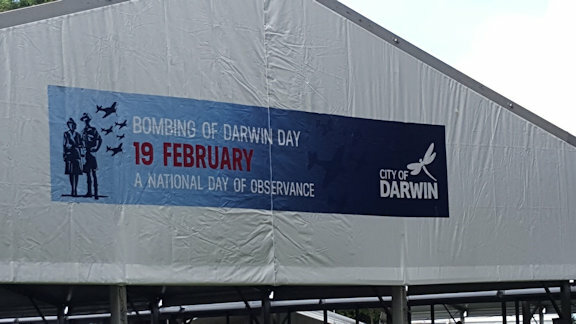 Two reasons; to attend the commemoration ceremonies for the 75th anniversary of the bombing of Darwin and to experience Darwin in the wet season. We have been to Darwin numerous times and at different times of the year but never during the wet. The first thing to remember if you are flying to Darwin, no matter what the time of year is that stepping out of the plane onto the tarmac is like being enveloped in a huge warm wet sponge. It can take your breath away. It generally doesn’t take too long to become accustomed to the heat and humidity but that first assault is memorable. On this trip we did not have our own transport and used the public bus system. Bus fares in NT are very generous. For $20 you can purchase a 7-day unlimited travel ticket, $7 concession. Travel is free for NT school students (in uniform), Veterans’ Affairs Gold card holders, Vision Impaired Travel Card holders and Companion Card holders and their companions. WWII Navy Oil Storage Tunnels Number 5 and Number 6. Following the bombing of the fuel oil storage tanks at Stokes Hill on 19 February 1942 in the first Japanese air raid, engineers began looking at British government designs for oil storage tanks in underground tunnels secure from aerial bombardment. Work began in 1943 to build a series of tunnels and underground storage tanks to hold distillate fuel, diesel and furnace oil. The tunnels were lined with concrete and thin steel to prevent cracking under the expected bombardment. By November 1944 the tunnels that still exist today, 1,5,6, 10 and 11 had been lined with welded steel sheeting. Despite these precautions, it became apparent in 1945 that the tunnels leaked. As water seeped between the steel lining and the concrete walls, corrosion set in. Various solutions were attempted but with little success. By the end of the war, estimated costs for the entire project, if completed, would have been well in excess of £1 000 000. In the 1950s, tunnels 5 and 6 were used to store jet aircraft fuel for the RAF and RAAF. After about three years and a period of heavy rain the whole system became inoperable because of seepage and was not used again. Tunnels 5 & 6 were opened to the public in 1992 to commemorate the 50th Anniversary of the Bombing of Darwin, with a total length of 673 metres. Each tunnel is 4.5 metres wide and 5.4 metres high. Walking distance from CBD. The Darwin Military Museum, East Point, Darwin, NT. 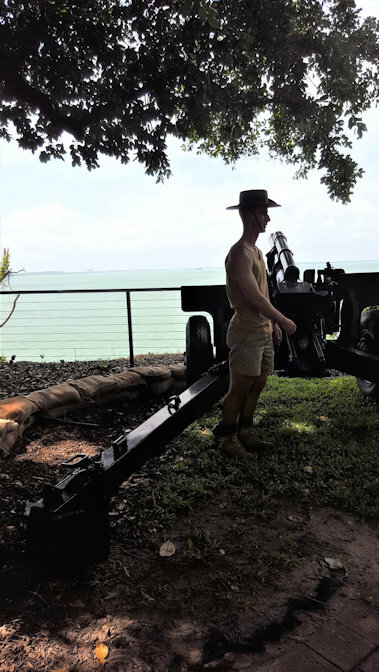 In the 1960s, the Royal Australian Artillery Association (NT), in an effort to stop the vandalising of the 9.2-inch gun emplacements of East Point made the area into a small museum. These guns, together with many six-inch guns, formed the anti-ship defence of the town in World War II from the first bombing on the 19th February 1942 and the 64 subsequent attacks on Australia. Over the years the museum has grown in size and stature. In 2012, the Defence of Darwin Experience was added to the precinct. The exhibition space includes the Bombing of Darwin Gallery, iconic objects from that time, firsthand accounts and multimedia presentations. The new Experience is surrounded by the other buildings and artifacts of the Darwin Military Museum, artillery pieces, vehicles, uniforms, firearms, models and paintings and much more. Many of the exhibits are outside and you can see how exposed the tiny wartime city was. One of the highlights of the Defence of Darwin display is an 11 minute DVD depicting the Japanese bombing of the city. It is played in a theatrette with surround sound. While it is often assumed that Darwin was the only place attacked, many other locations in the Territory were also bombed. The museum also has information and artefacts relevant to other areas of northern Australia which were attacked during WWII. Note: this is one of the few areas in Darwin that is not accessed by the public bus system. You will need to be a good walker, hire a city bike or take a taxi for this one. At the end of Smith St you can walk off the escarpment, across a footbridge and into a lift which takes you to the waterfront. Take a wander and check out the cruise ship dock, the pier area, the green and lush lawns and gardens, have a long lunch at one of the many eateries or go for a swim in the safe swimming lagoons. For the more adventurous the only waves to be found in Darwin are in the wave pool (the Wave Pool is patrolled by life guards and entry fees apply). From Stokes Wharf you can take a tour or cruise of the harbor. If you don’t mind a bit of a hike and a few stairs you can walk around to the Esplanade area. Lush tropical gardens and views over the Arafura Sea. Stormclouds over the waterfront area. Darwin Aviation Heritage Centre. This is a must see. If for nothing else, just to get an idea of the sheer enormity of a B52 Stratofortress “Darwin’s Pride”. The aircraft was given as a gift to the people of Darwin and is one of only two on display outside America. B-52 bombers used Darwin Airport. It is the most northerly airport that is RAAF owned and controlled in Australia and allows circumnavigation of the globe without flying over large areas of land. The statistics of this aircraft are truly gigantic. The aircraft is capable of mid air refuelling. It uses 81,000 litres of fuel to takeoff and reach cruising altitude. Fuel load approx 100 tonnes. Longest continuous flight time for a B-52 – 32 hrs. Other exhibits include an Auster biplane, a Japanese Zero fighter, shot from the sky in 1942, a Tiger Moth, the remains of a crash-landed RAAF Mirage jet, a Spitfire replica, a B-25 Mitchell Bomber and even a few of the first attack helicopters. Easily accessed by public bus. In 1966 a bill was passed to create a Territory museum and Art Gallery. 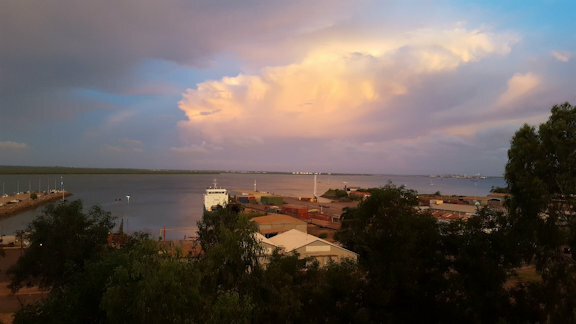 It was first located in the renovated old Town Hall in Darwin’s central business district, but on Christmas Eve 1974, Cyclone Tracy destroyed the old Town Hall, damaging much of the collection. After many temporary homes the new purpose-built museum and art gallery was opened at Bullocky Point, on the site of the old Vestey’s Meatworks on Sept 10, 1981. There are permanent exhibitions including Aboriginal Art, Southeast Asia, Cyclone Tracy, Transformations, Maritime History and Sweetheart and a number of touring exhibitions. For us the Cyclone Tracy display is the most moving and the sound booth is so eerie it makes your spine tingle. The museum’s most popular display is Sweetheart. In the 1970s, Sweetheart gained notoriety for attacking dinghies at a popular Darwin fishing spot and tipping the occupants into the water (although no one was hurt). In 1979 the pattern of his attacks changed and Parks and Wildlife staff decided to relocate Sweetheart to a local crocodile farm. Unfortunately Sweetheart drowned in the attempt. On the 19th of July 1979, Sweetheart was caught in a trap and anaesthetised, but in the attempt to haul his considerable bulk ashore, the animal became entangled with a sunken log and drowned. Sweetheart was the dominant male crocodile in Sweets Lookout billabong, hence the nickname. Although a large mature male, Sweetheart is not the largest crocodile and it is estimated that he was probably over 50 years old. Mindil Beach Market. 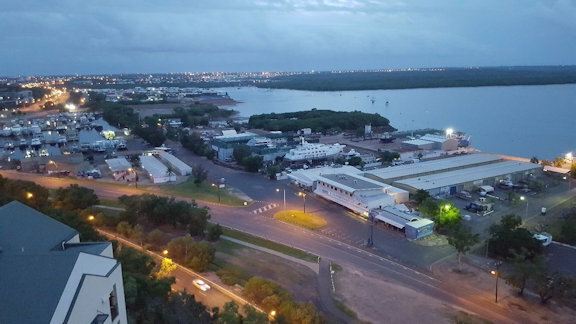 Although the market is closed during the Wet Season, if you happen to be in Darwin during the Dry Season you must head out to the market on a Thursday evening. Sitting on the sand watching the huge blood red sun drop into the ocean is a must. Then head across to the market, sample food from every nation and check out the many and varied stalls. 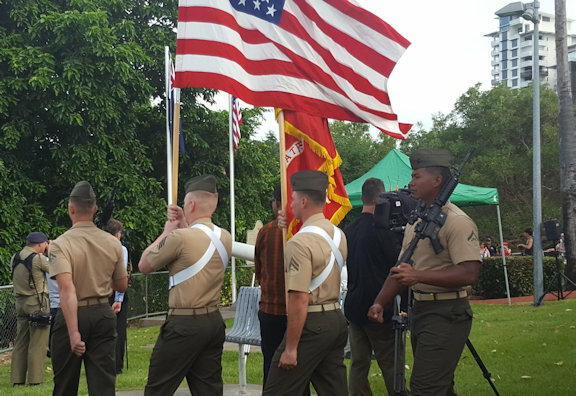 Memorial Service for the USS Peary. Feb 19, 2017. Memorial Service February 19, 2017. Re-enactment of anti-aircraft gunfire. February 19, 2017.